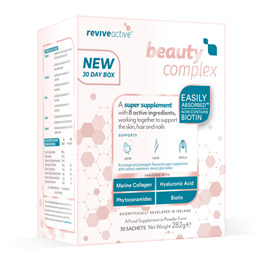 Beauty Complex is the latest product in the Revive Active range. 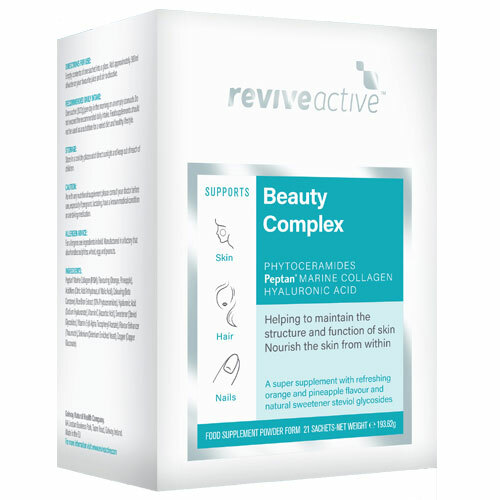 As with all Revive Active products, Beauty Complex contains the best ingredients in optimum quantities. Revive Active chose the best form of collagen, Peptan® Marine Collagen as collagen is the foundation of the skin. Phytoceramides, derived from rice, are a natural alternative to enhance the skin. Phytoceramides contain lipids that are the same as those naturally found in our skin. They penetrate each of the four layers of our skin boosting our natural production of collagen which leads to skin plumpness. Finally, the third key ingredient is hyaluronic acid which acts as a natural moisturiser. Included in each sachet is 100mg of Hyaluronic Acid, 100mg of Phytoceramides and 7,000mg of Marine Collagen to complement the other natural ingredients. One sachet per day in the morning on an empty stomach. Empty contents of one sachet into a glass. Add approximately 300ml of water or your favourite juice and stir to dissolve. As with any nutritional supplement please consult your doctor before use, especially if pregnant, lactating, have a known medical condition or are taking medication. Manufactured in a factory that also handles suplhites, wheat, egg and peanuts. Below are reviews of Revive Active Beauty Complex - 21 Sachets by bodykind customers. If you have tried this product we'd love to hear what you think so please leave a review.